A new invention from a Washington painter can transform any string of letters or words into a reproducible work of art. Have you ever heard of synesthesia? It's a fascinating concept. The five human senses - sight, sound, smell, taste, and touch - misfire in some people, causing them to "taste" sounds, "see" flavors, or associate words and numbers with colors. This concept has fascinated writers and artists for generations, and its latest learner is a Washington-based painter named Tyree Callahan. After becoming interested in the interplay between words and art, Callahan created a device that could connect the two: a chromatic typewriter. Instead of inked letters, this apparatus dispenses splashes of color, making it possible to transform anything from a grocery list to Great Expectations into a full-color painting. Callahan's paintings reveal that his art concerns itself with the interplay of light, shadow, and color. 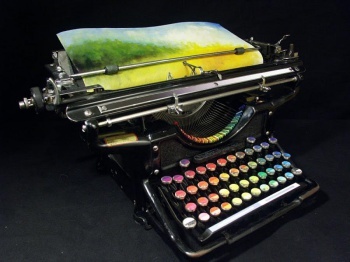 The chromatic typewriter is no exception. Without giving away the exact impetus behind the typewriter, he explains that his home, the Pacific Northwest has inspired much of his art. "I live in an environment that can produce both vivid and somber landscapes, often both within an hour." The typewriter itself is fairly simple in concept, if not execution. It replaces a standard keyboard with a rainbow palette. There are no letters on the keys, but anyone who can type without looking at the keyboard can create a work of art. "It seems to be making a lot of people happy and it has started some great discussions on the translation of art into words and words into art," says Callahan. "And folks with synesthesia seem to like it the most!" At present, you can vote for the typewriter's inclusion in West Collects, a modern art gallery. The voting process is only open to iDevice users, but Callahan would appreciate your votes just the same. "You'll be quite happy to know that every vote for the typewriter saves a precious kitten from the tortures of hell." Support a creative art project and save a kitty? That sounds like a win-win.